I was a little nervous because I've never had a pencil tree. But once I got it out of the box and started to fluff it up, I knew I had made the right choice! I personally think it looks fabulous and Elvis made it even more gorgeous! 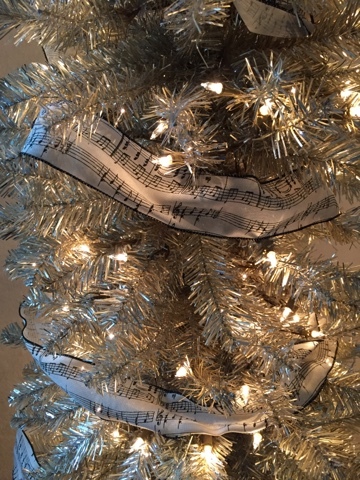 For the garland I wrapped the tree in this music sheet ribbon. Don't you just love Elvis?! I love your tree! My husband would really love your tree, as he is a huge Elvis Fan. He even has some of those ornaments. We usually set up a bunch of little trees, so maybe he'll have an Elvis tree this Christmas too. Although, he won't have that cool music garland. Love the gold tree! Very different from the traditional trees! 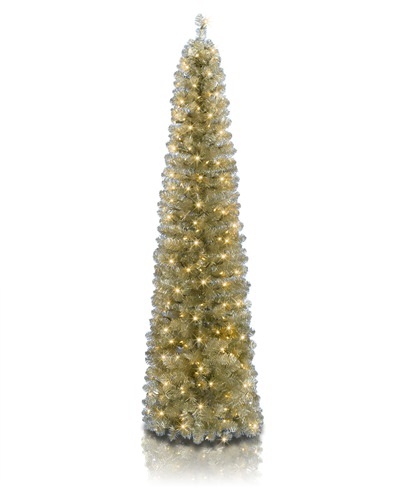 Awesome tree, the gold was a good choice and the ribbon is gorgeous.